During recessions, not all industries experience the pain (and the enusing recovery) at the same time. Some industries get hurt first, while others don't feel the ripple effect for several months. With Wall Street's over-emphasis on the importance of current earnings, understanding these cyclical troughs can help value investors profit. "As our 2008 results illustrate, HPS has come through these challenging economic times relatively unscathed." "Going forward, it is fair to say that the global economy is performing worse than even our most pessimistic forecasts of six months ago." The stock price has of course responded to the current earnings environment for this company, rather than its long-term earnings power, as it is down over 20% in the last two months. If the stock continues to fall due to drops in demand that are of a short-term nature, it will once again provide the long-term investor the opportunity to purchase a good company at an excellent price! Buying companies that are in the midst of cyclical troughs is an excellent way to derive long-term profits*. *The tricky part, of course, is ensuring a company is indeed going through a cyclical and not a secular downturn, and has a financial position and cost structure such that it can survive/thrive until better times return. In March of 2009, panic in the market led to an enormous number of value opportunities. Believers in market efficiency would be hard-pressed to justify some of the depressed valuations prevalent in the market at that time. Some companies have already posted tremendous gains in the four months that have passed. One such example is Spartan Motors (SPAR), designer and manufacturer of heavy-duty vehicle chassis. The auto industry is clearly going through a tremendous slump, but investors went overboard in punishing the valuations of many of these stocks. Since hitting its low in March, the stock has already quadrupled. But how was an investor to know that SPAR was undervalued? The company traded for just $75 million in March, but had cash of $14 million, receivables of $76 million, and inventory of $87 million, for a total of $177 million. Meanwhile, the company had total liabilites of just $90 million, for a difference of $87 million. In other words, the company could be purchased for its inventory, with its fixed assets, R&D, and customer relationships thrown in for free. For a company that has remained profitable throughout this downturn (including 2008 operating income of $69 million), this represented a tremendous bargain. While most companies have recovered from their lows in March, many have not. Fifty-two week low lists continue to show investors which stocks are out of favour. Of course, not all out-of-favour stocks offer value, but the current environment still offers plenty of upside to those willing to make the effort to uncover the diamonds in the rough. Man has a follow-the-leader tendency. While this can often lead to effective group operation, particularly when the leader is proficient, it can lead to disaster if the leader is wrong or if the leader's communication is misunderstood. This is due to the fact that followers will often ignore logic in the belief that the action as suggested by the leader must be correct. Munger describes several situations, from the humourous to the disastrous, where the instructions of leaders were clearly wrong or misunderstood, yet the followers would perform seemingly illogical acts in the belief that the leader must know what he's doing. Hitler's ability to convince a group of people to commit genocide is a particularly grave example. Because people will follow leaders whether they are wrong or right, it is extremely important to choose good leaders. Many CEOs are able to remain in power because of the respect they are afforded due to their positions! Munger notes a specific example where a CEO was blind to reality but remained at the helm of his company simply because of the respect afforded to his position. Skills degrade when not practiced. The antidote to this unfortunate reality is to frequently practice useful but rarely used skills. This is akin to how pilots use flight simulators to practice rarely-used skills that they can't afford to lose. Munger argues that if man does not practice his existing skills, his learning capacity will also shrink. This is due to the fact that he creates gaps in the framework he needs for understanding new experiences. A wise man creates a checklist of his skills, to ensure they are kept sharp. But this tendency does not treat all skill bearers equally. If a skill is practiced diligently until fluency is reached, it degrades much more slowly and is refreshed much more quickly than if a skill is quickly crammed to, say, pass an exam. With advanced age also comes more severe deterioration of skill. But an individual can maintain well-practiced skills to even a very old age. Munger also argues that continuous thinking and learning can help delay the deterioration that is inevitable. Regular readers know that, as value investors, we generally prefer companies with relatively low debt levels. The reason for this is that companies with low debt levels will fare much better than their competition during times of economic distress, providing for better downside risk protection. But looking only at a company's debt level does not provide a complete picture of a company's risk related to its debt, as even similar companies with identical debt levels can vary dramatically in their debt-related riskiness. Consider Escalade (ESCA), the world's largest producer of table-tennis tables (and other gaming items). Escalade has long-term debt of $45 million. To give an idea of the relative size of this debt, consider the fact that Escalade has averaged $9 million of operating income per year over the last four years. But while the debt is listed as "long-term" because it is not due within 12 months of the most recent financial statements, "long-term" is hardly an accurate description. All $45 million is due in May of 2010, just 10 months from today! Practically speaking, this represents a huge difference to a situation where the debt is not due for 10 years. Added time to maturity allows the company to plan accordingly, building up cash reserves from operations or other sources of financing in due time. Instead, this company is reliant on a debt market that is shaky and expensive for this type of company. As a result, the company will likely have to sell some of its assets at the current market's firesale prices! An important complement to what debt is due (found on the balance sheet) is when the debt is due, which can be found in the notes to the financial statements. There's a plethora of information available to investors from brokers, analysts, the mainstream media, and financial bloggers. But there are conflicts of interest abound in this industry, resulting in the fact that you cannot trust anyone but yourself. This became abundantly clear to me recently as I was approached by more than one agent presumably looking for exposure for their respective clients: the agents were offering to pay me to write about certain small companies. By itself, this is not such a bad thing. The small companies would get exposure, the readers would get my thoughts on a stock (presumably one of the reasons they read this site), and I would receive consideration. Everybody wins, right? Well, only if certain rules are followed. But when I presented these rules (e.g. my opinion would be expressed rather than simply a favourable recommendation, the payment would be made upfront so as not to influence my opinion of the stock, the payment would be set ahead of time only rather than a bonus based on the stock's performance, the fact that I'm being compensated would be disclosed) the agents quickly declined and moved on. But that doesn't mean they disappeared; it likely means they searched, and perhaps found, another conduit for their message. Unfortunately, this means that you should assume that everything you read is biased, because you don't know when you're getting an independent opinion and when you're not. The antidote to falling prey to this unscrupulous behaviour is to treat the information you read as a starting point, not a complete analysis. Investors must do their own research by reading the company's disclosures; only then can their conclusions be trusted. Do your homework! CE Franklin (CFK) has the makings of a terrific value stock. It has a history of fairly stable revenues and earnings, and appears to trade at a discount to those earnings. From an asset point of view, the company's current assets cover all of its liabilities with enough room left over to cover the company's market value. There's just one problem: the company's industry. CE Franklin distributes industrial supplies to the oil and gas sector. While maintenance and repair supplies, even to this sector, can be fairly stable, half of the company's revenue exposure relies on new capital spending by oil and gas companies. The amount of capital spending by oil companies can vary dramatically depending on the price of oil. While there are many who believe the oil price will rise again soon, and others who believe it will fall, there's no reason to make a bet in either direction if you don't have to. Many intelligent people who follow the market will tell you that they don't know which way oil prices will move, and that's a perfectly fine position to take. We're not interested in guessing, but rather in finding opportunities with strong upside potential with minimal downside risk. CE Franklin certainly has the upside potential, as it trades at a discount to its assets, and a positive move in oil prices will likely result in strong price appreciation. Unfortunately, the downside risk is not minimal, as falling oil prices will result in shelved capital projects that would bring revenues dramatically lower. An important theme of value investing is that one does not have to take a position on every stock. While other analysts tend to believe a stock will either go up or go down, value investors are content to say "I don't know" on a majority of stocks, and only invest in the ones they are relatively sure about. Unfortunately, this profile is not dissimilar to that of other companies in the shipping industry. Clearly, it is unlikely that there is any cash left over after these massive capital investments are funded. Rather than using earnings to pay shareholders, the company has needed a source of financing to fund an expansion. That source has been debt financing, as the company has increased its D/E from a more reasonable 65% to its current 90%. As this company has ramped up its expansion, it has put itself as risk. Despite what the growing earnings record may show, this company is in no position to reward its shareholders. The high debt levels combined with the fact that the company is in a cyclical industry suggests trouble is ahead, especially if the industry is expanding while the economy is not. While in other industries capital expansion can be cancelled and in some cases capacity can even be cut, this is not the case in shipping. Due to high manufacturing lead times, GASS is contracted to buy several more ships through 2012! These contractual obligations will require another $135 million in financing! Since other companies in this industry are in the same position, supplies of ships will continue to increase in the next few years, while goods that need to be transported are slowing. This leads to lower revenues and reduced fleet values...a situation investors should be wary of entering, despite the earnings growth profiles these companies have shown in the last few years. While stock market values of these companies are depressed (GASS' P/E is less than 5, and its P/B is .33), long-term investors should ensure their company is not too laden with debt and expensive commitments to outlast what could be a rough few years for this industry. When information is readily available, humans tend to put more emphasis on the value of that information. It is not only unavailable information that is underweighed as a result, but information that the brain can't remember or is blocked from using as a result of being influenced by another tendency. Munger describes the main anitode to this tendency is the use of standard procedures (or checklists). Another antidote involves emphasizing factors for which numerical data is not available. Finally, one can hire intelligent, skeptical and articulate minds to argue against incumbent opinions. While vivid and memorable evidence should be consciously underweighed (since it is subconsciously overweighed), such evidence can still be very useful. For one, it can be used constructively to persuade others of a correct conclusion. For another, it can be used to improve one's memory by attaching vivid images to items one does not want to forget, a technique of Greek and Roman classical orators who gave long, organized speeches without notes. The lesson of this tendency is to understand that an idea or fact is not worth more simply because it is available. It is known to many that stress causes an adrenaline rush that results in faster, more extreme reactions. Furthermore, light stress can improve performance, but heavy stress can cause dysfunction. But Munger argues that few people understand the mental breakdowns that stress can help cause, apart from depression. Munger discusses various stress-related experiments run by Pavlov on dogs that demonstrate the awesome power of stress. In these experiments, Munger discusses the fact that Pavlov was able to identify how easily a particular dog would succumb to a nervous breakdown, that any dog could be broken down, and that a breakdown could only be reversed by imposing more heavy stress. Munger asserts that stress can be so powerful that it is the key ingredient in the success of cults. Some of Pavlov's work could conceivably be applied to help parents 'deprogram' children that have been broken down by cults. While the business or investing implications of this human tendency are not immediately obvious in this discussion, Munger wished to bring up the subject of stress lest his examination of human tendencies be glaringly incomplete. In the last few months, we've looked at a couple of examples of companies that have a significant percentage of their revenues tied to one or more customers. For example, JAKKS Pacific (JAKK) receives 33% of its revenue from Walmart, which, all else equal, is more risky than a company with evenly distributed revenues. Today we see an example of a company that has been burned by its reliance on Sears. 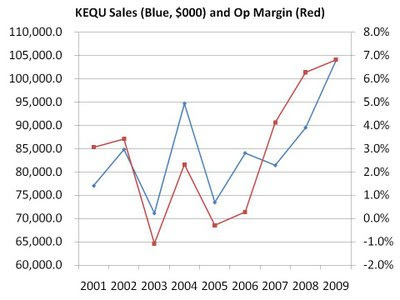 As we've discussed previously, Escalade (ESCA), maker of gaming tables, has looked cheap across a number of metrics. But shareholders paying attention to the company's disclosures would have seen a key risk in the fact that almost 20% of the company's sales were to Sears. While an astute reader pointed out that concentrated customers with contracts can actually provide revenue certainty, there were no contracts in this case, which reduces certainty dramatically. In 2008, Escalade and Sears could not agree on terms for products representing a significant amount of sales, despite the fact that these companies have a 30-year relationship! As a result, the company lost 12% of its sales just like that, and the remaining sales to Sears are now at high risk of being discontinued. While Escalade may recover from this revenue shock by cutting costs and selling assets, it is not out of the woods yet. The stock has dropped by 80% in the last year, and the company is considering removing itself from the Nasdaq to save on costs! When confronted with companies reliant on a few concentrated customers, look for contracts! If there aren't any, proceed with caution and understand the risks. Companies offering mortgages or related products are currently out of favour in the stock market, and often with good reason. Many companies spent the last few years borrowing money, and then lending it out carelessly, expecting to make profits on the spread resulting in high returns on minimal equity. When customers couldn't afford to pay back thanks to the downturn, the borrowed money remained due, resulting in strong chances of default for the lender. But not all mortgage companies find themselves in such high risk positions, but you wouldn't know it from their stock prices. Consider Quest Capital (QCC), a real-estate mortgage financier. The company is owed $386 million from borrowers, all of which is secured by real-estate or corporate/personal guarantees. Based on the value of the underlying real-estate and the quality of these guarantees, the company estimates that it will recover $370 million of these outstanding loans. Even if you believe that mangement is not conservative enough with respect to estimating these losses, the losses would have to be 900% higher than management's estimates to justify the stock price of this company, as the stock trades as if the loans due are worth just $240 million. The reason the value of QCC's loan portfolio can drop so much and still hold value for the equity holders is that extensive use of leverage is not in use. The company is financed with just $46 million of debt and $40 million of pref shares along with common equity of $290 million. But this equity trades on the market for just $120 million. The Company currently plans to pay cash for any future dividends declared on the Preferred Shares. Humans do as other humans do. This tendency has likely been beneficial throughout Man's history (e.g. in running away from an unseen predator because everyone else is doing it), but it causes some intriguing actions. For example, psychology professors have observed men turning around and facing backwards in elevators after the others (in collusion as part of the experiment) in the elevator have done so. Social-proof tendency has also been frequently used to cause subjects of experiments to make wild measurement errors simply because they trust the group's conclusions more than their own. Munger sees this tendency often in the business world. When one management purchases a mining company, the competitor's management will seek to follow suit. When several competitors are involved, this often leads to a bidding war and the overvaluation of target companies beyond logic. Not only negative actions are contagious, however; both good and bad behaviours are copied as a result of social proof. Therefore, Munger stresses the importance for human societies to stop bad behaviour as well as stress/display good behaviour. Furthermore, it is not only actions that serve to perpetuate social proof, but also inaction. Munger sees many companies' boards of directors as excellent examples of copied inaction leading to detriment: many directors fail to object to the group's line of thought until some form of public embarassment has been felt. Munger finishes his thoughts of this tendency by offering the following advice to readers: "Learn how to ignore the examples from others when they are wrong, because few skills are more worth having." Although the Q2 period covers the days between the beginning of April and the end of June, because the fund is in its infancy (it launched June 1st), the period covered here is only one month. Also, considering the fact that the fund is of a long-term nature (i.e. not looking for quick, in-and-out-like trading profits), monthly reports are particularly unrevealing. Nevertheless, it is important that investors receive timely updates on their investments, and this will serve as the first such update. The market value of one share of KVF rose by 0.25% over the month of June (compared to a -2.4% return of the benchmark index) bringing the value of each share to $10.03 versus the opening share value of $10.00. While it would be nice to say that the average stock in KVF increased by almost 3% in the month as compared to the benchmark, this was not the case. Portfolio returns were aided by favourable currency movements between the Canadian and US dollars. There are no plans for the fund to hedge USD/CAD currency fluctuations. As such, currency movements could affect returns over short periods, but are not likely to be a factor over the long term. The dramatic fall in revenues following the last recession might be exaggerated to some extent: while we give a lot of flak to companies for blaming "one-time" events (which actually tend to re-occur) for revenue/earnings shortfalls, if there ever was a good "one-time" excuse for a company in NYC reliant on construction, September 11th is it. Nevertheless, the nature of the company's business is still cyclical: the company's backlog has been dropping fast, as several buildings contracted for development have been delayed or scrapped due to the recession. Therefore, what's important to consider is the company's lasting power, as measured by the flexibility of its cost structure. 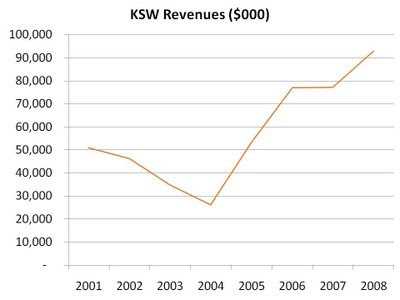 In the case of KSW, fixed costs are a small percentage of operations, as the company only purchases what it needs to install (therefore costs are largely variable) resulting in fixed assets comprising only a fraction of the company's total assets. Furthermore, debt servicing requirements are minimal, as the company has a debt position of $1 million, an amount which is dwarfed by its cash holdings of $17 million. The stock, however, has been pummelled by the market, and trades for less than the company's cash on hand. Considering the fact that the company has a flexible cost structure and a cash position greater than its market price, investors are being offered the company's future earnings for free. As an example, consider Goodfellow (GDL), a stock we have discussed on this site as a potential value investment. 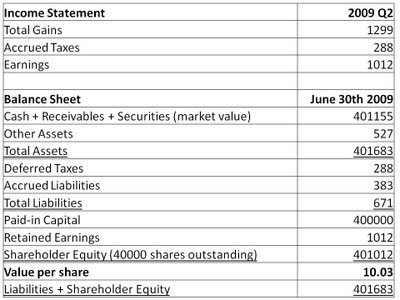 In its most recent quarterly results ended May 31st, revenues dipped by about 15% from year-ago levels. Yet the company showed profits of 24 cents per share versus 20 cents one year ago. How did it do this? 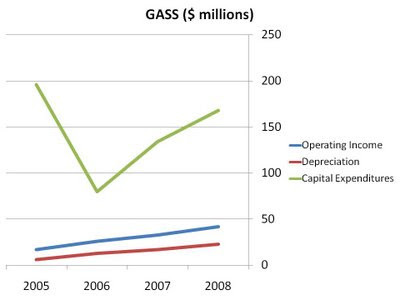 By paying down debt (and therefore reducing interest costs) and by slashing operating expenses: gross margin actually increased which is very rare when revenues decline, as fixed costs are spread out across fewer sold units. Last week, we looked at the historical price to book value of Melcor, and noticed that it sells today near historic lows. While this may suggest a buying opportunity to some, many would argue that varying levels of price to book ratios are appropriate based on changing expectations for the value of Melcor's book value. For example, if real estate prices are expected to increase, price to book values should be higher, since the company will experience gains as it sells land for higher than it is booked. Conversely, if prices are expected to contract, writedowns to book value should be expected, and therefore investors should only purchase at a discount to book value. Clearly, whether times are good or bad, Melcor's book value does not change dramatically. Even through this most recent downturn, which hit Western Canadian real estate prices hard due to their local economic exposure to commodity prices, Melcor's book value retreated only marginally or stayed flat. 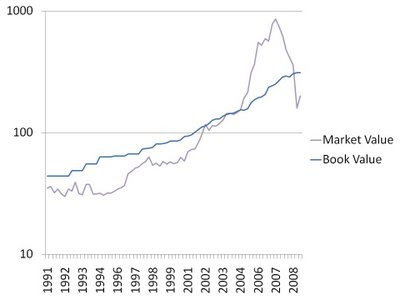 Through the commodity and real estate price run up from 2004 to 2007, book values did increase more than normal (as gains were realized), but not nearly enough to justify the dramatic price increases which made this stock fiercely overpriced! Indeed, it would appear that while the market appears able to predict the direction of book values, it overreacts both when book values are rising and when they are not. This theme is not specific to Melcor. As we saw when we looked at several major US homebuilders, during times like these the market will often offer real estate at large discounts which are more than enough to offset any upcoming writedowns. Determining whether a company or industry is historically cheap by looking at P/B values is not limited to home builders. We have previously seen how the relative valuations of banks can also be judged on this basis. The tendency that Munger describes as "deprival" is the human tendency to hate losing more than liking winning. For example, the loss of a ten dollar bill seems to hurt much more than a gain of ten dollars seems to help. The problem with this tendency is that man misprioritizes his problems. For example, a man with a brokerage account containing $10 million will agonize over missing $100 from his wallet. This irrational tendency to be intensely focused on small losses, whether to property, friendship, territory, status or other valued items is quite normal. Munger notes that this tendency has ghastly effects in labour relations. When a corporation is in trouble, workers find it very difficult to give up benefits they currently enjoy, even if it is in everyone's best interest to do so (to make the company more competitive). As a result, many companies go bust when, had rational thinking prevailed, the situation could have been corrected. This tendency also causes the form of business failure that encourages otherwise wise men to use up good assets in fruitless attempts to rescue a venture gone bad. Munger also believes this tendency is what drives gamblers towards ruin: once he has suffered a loss, the gambler becomes obsessed with breaking even in order to recover that loss. Being cognizant of this tendency can help one focus on making rational decisions rather than throwing good money after bad. Munger starts his description of man's tendency to be over-optimistic by quoting the Greek orator Demosthenes, who said "What a man wishes, that also will he believe." In addition to psychologically denying when things are going badly, man will tend to be overly optimistic when things go well. For evidence of this tendency, Munger points to people happily buying lottery tickets despite having the odds stacked against them. People also believe in new business ideas that are often poor substitutes for efficient, existing companies. Munger believes that while this tendency has likely been helpful for evolutionary reasons, it is best to approach issues more objectively. To do so, individuals are encouraged to make more use of the simple, high-school level, probability math of Fermat and Pascal. Munger likens avoiding the antidote to this tendency (the antidote being habitual use of probabilities) to letting natural evolution determine one's golf grip rather than taking golf lessons. Charlie Munger is Warren Buffett's right hand man at Berkshire Hathaway. Over the next few weekends, we'll be summarizing the text he authored titled "The Psychology Of Human Misjudgement", where he describes some of man's tendencies. By understanding and learning from these tendencies (without having to grab an online psychology degree), we better equip ourselves to avoid psychological biases when investing. Ninety-percent of Swedish drivers believe themselves to be above average drivers. This is an example of the tendency of man to overrate his own abilities. This tendency can also be extended to man's possessions: once a man owns something, he places a higher value on its worth than he otherwise would. The repercussions of this tendency are visible in various forms. Lotteries where gamblers can pick their own numbers (as opposed to being offered a random set) are bigger draws. Man will also strongly prefer people like himself. In a "lost-wallet" experiment, subjects were found to be more likely to return a wallet to a stranger when that stranger resembled the subject. In business, excesses of self-regard can often cause poor hiring decisions. (The hirer believes in his superior ability to select a candidate in a face-to-face, and therefore ignores more objective measures of a candidate's value.) Munger actually points to the hiring of the well-spoken Carly Fiorina as CEO of Hewlett-Packard as an example of a mistake due to this tendency. Munger argues that the best antidote to falling victim to this tendency is to try to think objectively about oneself, one's family and one's possessions. While this is not easy, it is far preferable than allowing one's psychological biases to control one's thoughts. Investors who buy stocks without reading the company's disclosures leave themselves open to risks of which they are not even aware. Consider Escalade (ESCA), a diversified producer of sporting goods and office equipment. Escalade is cheap across a variety of metrics. It trades for just $10 million, despite having operating income exceeding $10 million in each of the years 2005, 2006 and 2007. Though the recession turned results negative in 2008, the company has cut costs aggressively and has a good chance of turning a profit in 2009. The company trades with a price to book value of just .12! "The Company is considering the potential for voluntary delisting of its common stock with NASDAQ". Why might they be considering this? "In complying with those reporting obligations and the additional requirements imposed upon public companies pursuant to the Sarbanes-Oxley Act of 2002, the Company incurs significant annual out-of-pocket costs. In addition, the time and attention required of management to comply with all such requirements is substantial." "As a small public company, particularly in light of recent economic conditions, the Company has not been able to take full advantage of the potential benefits of being public yet must continue to satisfy all of the requirements to remain a public company." "No final decisions have been made in this regard, but such actions would have a material impact on stockholders if taken." While the risk of delisting may not prevent some investors from being interested in a cheap-looking stock, for others this falls outside the bounds of what is considered an acceptable investment. As such, it is important that investors read a company's disclosures before deciding to invest, lest they be caught unaware of a potentially detrimental future event. I am pleased today to announce the launch of Karsan Value Funds (KVF), a long-term oriented, value investment fund that I will manage. The fund will take equity positions in public companies which trade at discounts to their intrinsic values and where downside risk is low compared to upside potential. As it can take many years for such companies to return to trading at their intrinsic values, the investment horizon of the fund is of a long-term nature. To that end, investors will be discouraged from short-term dispositions of their securities. Investors will also be unable to sell securities to anyone other than the fund, since new investors may not fully understand the partnership's strategy, and there are certain legal restrictions. Although the fund will report financial results every quarter, emphasis will be placed on long-term returns, not quarterly results. The fund will likely start out with a capitalization of approximately $400K. As such, using a registered dealer, registering as a dealer, or issuing a prospectus will be prohibitively expensive in the initial year(s). Therefore, the fund's shares are not currently available to the public. We look forward to providing more information and publishing the first set of results in the near future. Of course, I am always looking for new ideas. If you have any stocks you favour that you believe may fit the investing profile of the fund described above, I'd be happy to hear about them in the comments section. Happy investing!